Verizon LG K4 model number spotted in Verizon Database? A new LG handset with the model number LG-K120AR was spotted in a database entry together with other Verizon Wireless phones. 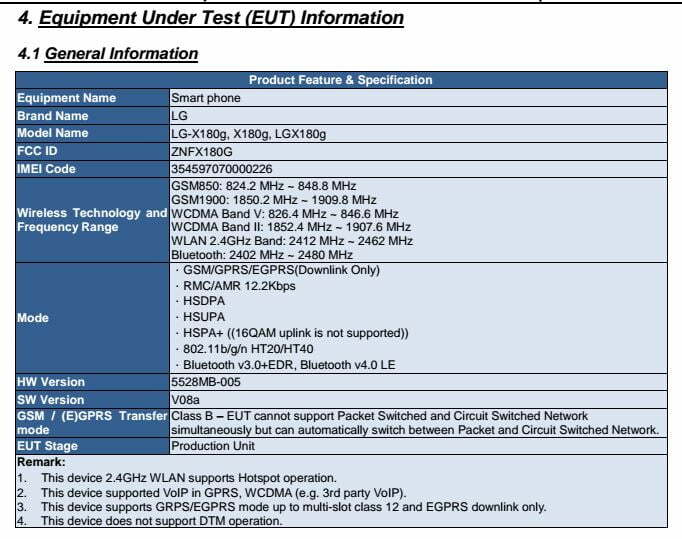 In last Dec., The LG K120 model was approved by the FCC. Based on the information from the device’s SAR test report, the LG K120 model measures 66.7 by 131.9 millimeters. LG officially announced the … Read moreVerizon LG K4 model number spotted in Verizon Database? A new LG handset carrying the model number LG X180g has been spotted passing through FCC approval. According to FCC listings, – the device’s SAR TEST REPORT, The LG x180g supports GSM 850/1900, W-CDMA 2//5, WIFI 802.11 b/g/n, Bluetooth V3.0, Bluetooth V4.0 LE. 1. This device 2.4GHz WLAN supports Hotspot operation. 2. This device supported VoIP in GPRS, WCDMA (e.g. 3rd party VoIP). 3. This device supports GRPS/EGPRS mode up to multi-slot class 12 and EGPRS downlink only. The FCC listing does not mention other details and specifications. The LG X180g is a mid-range smart phone which is expected to be announced during CES 2016.